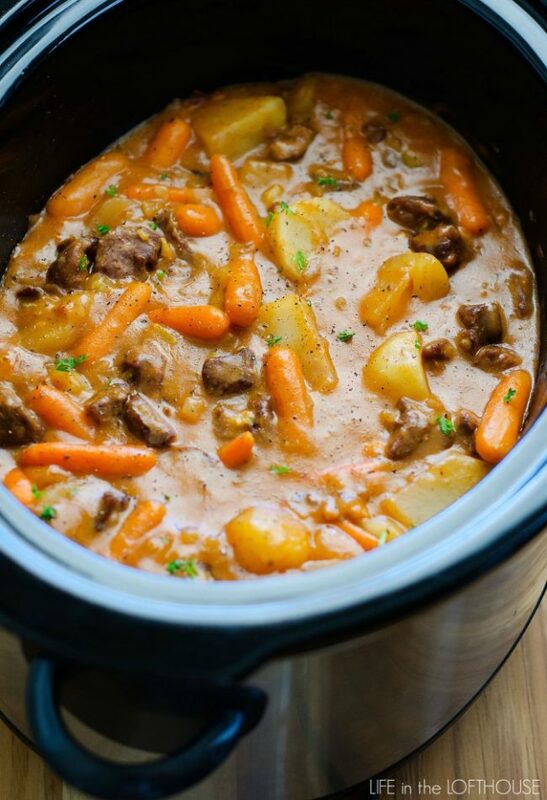 One of our favorite Sunday dinners is this Crock Pot Beef Stew. Hearty pieces of beef and vegetables slow cooked in gravy. Serve with buttered rolls and you’ll have one delicious meal! I can’t think of anything better than eating a warm bowl of Crock Pot Beef Stew on a chilly day. 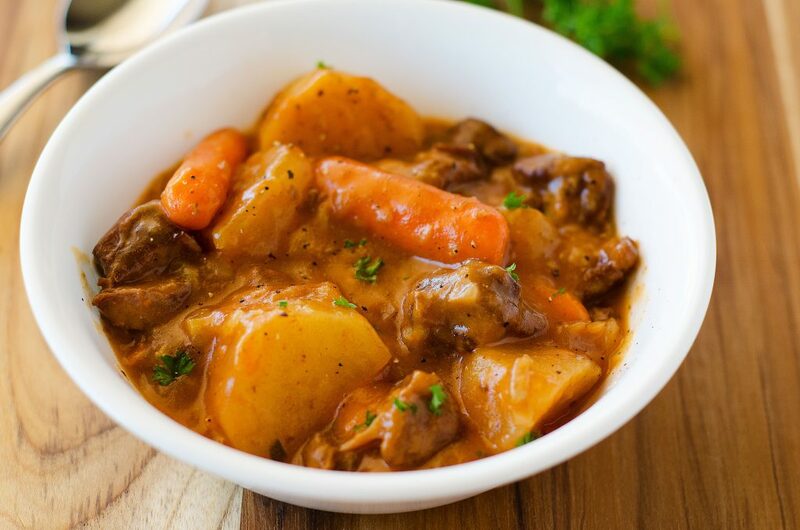 Too bad we’re still soaring in the high 90’s here, but before we know it the weather will be cooling down and we’ll be enjoying this amazing beef stew again. It’s the perfect Sunday meal to make for your loved ones. I’ve been making this for years and love to serve it with our favorite rolls. It is beyond delicious! 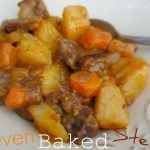 A delicious beef stew loaded with potatoes and carrots slow cooked in the crock pot. In a large plastic bag, combine the dry onion soup mix and paprika. Add in meat and shake the bag to coat meat with the seasonings. (You may have to do that step in two batches, for all the meat to fit) Once meat is coated, spread out evenly into a greased 7 quart crock pot. Top meat evenly with diced potatoes, carrots and onion. Mix the cream of celery soup and ketchup in a small bowl. Pour mixture over the meat and vegetables. Cover crock pot with lid. Cook on low heat for 8 hours or until meat is cooked through and vegetables are tender. Stir to combine everything then serve. This looks perfect for those cooler nights! you don’t add water or any broth right? I’m cooking it right now and see the cream of celery soup just laying on top. I want to stir it so bad! Am I supposed to wait to stir when it’s done? Hopefully you waited. Creamed soups need time to break down. If it stayed in a curdled stage, next time temp the soup. Add about one cup of the hot liquid to the condensed soup. Wisk until incorporated then add to the stew. Stir lightly. I didn’t add water to cream of celery soup the first time and family said, “it’s good, but has no broth”. So second attempt was make up cream of celery soup up per direction on can and everyone liked it better. This was as easy and delish as recipe looked and read. I was concerned about not adding liquid. Yet, the reviews calmed my concerns. It was excellent and will make it again and share this recipe with those I know! What can we use to replace the ketchup which has tons of sugar in it? Low sugar ketchup or tomato soup. I used a cup of jarred marinara. (Olive oil, roasted garlic and basil). It was the only tomato-based pantry item I had on hand and it tasted delicious. The only recommendation: if you’re crockpot is newer or gets super hot, go ahead and stir at the 6 hour mark so the meet does t dry out at the bottom. You can turn to warm shortly after. My warm is equivalent to low on most. I use a can of Rotel tomatoes. This looks way good, but I was just wondering…..does it need a little water to make the liquid and how salty is it? Thanks so much. My husband saw the picture and said that I needed to make it. Is the celery soup the condensed kind? Do you add water to it then? 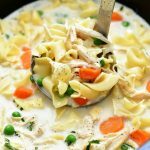 Could I use cream of mushroom soup instead of cream of celery? I’m sure you could. Not sure how the flavor would differ but I imagine it would still be great! It’s not “soup” – it’s stew. I didn’t read all the comments before making and I added the water with the soup? Did I just ruin dinner 🙁 ? I made this it was very good but it was to salty. I might just put 1 pk of onion soup in next time. Thank you for your recipe. I am a new subscriber to your blog. 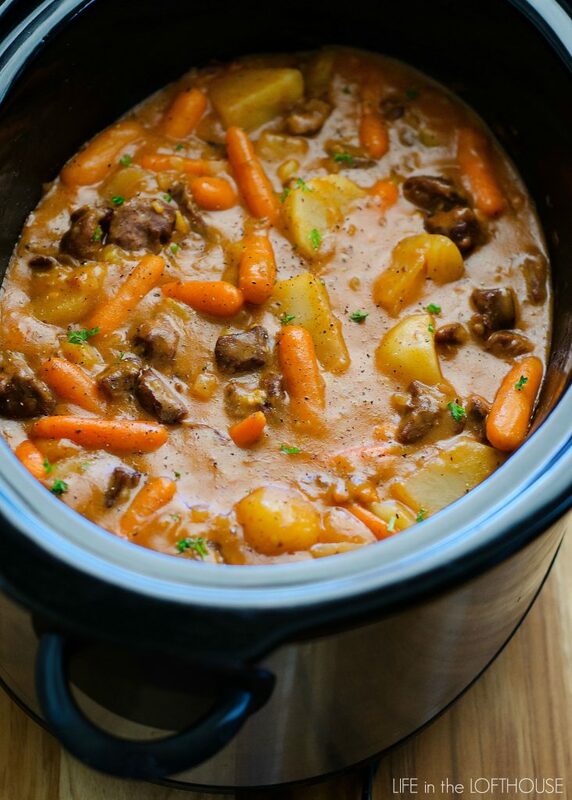 I made your Crock Pot Beef Stew this weekend…it was the best I have ever made!!! My husband and our boys loved it. I just shared this recipe with my sisters-in-law. I can’t wait to see what other crock pot meals you post. I am not a fan of ketchup, I can’t even stand the smell. How much ketchup taste comes out of this, as well as smell? Or can you suggest something to substitute? Toni, I don’t taste ketchup with this stew, but if you hate it that much you might. You could try tomato soup. I think it would work. The recipe instructions say to cook it on low heat for 8 hours. If you cook it on High I would imagine it would take 4 to 6 hours. All crock pots heat differently. Just made this recipe. Although nice and hearty, I think the ketchup taste is too strong. I will definitely make it again….maybe next time I’ll take it easy of the ketchup and instead add A-1 and/or Worchestershire. I agree with you. I feel that its way too much ketchup. The rest was great though! I just made this (it is amazing and easy btw!) and if you HATE ketchup, I can definitely taste ketchup in the end result.. Maybe try bbq sauce instead? I agree about the ketchup taste. I personally liked the taste, but all my husband could taste was ketchup. Trying it next week with a can of Campbell’s Golden Mushroom soup in place of the ketchup. Will determine if I should add ketchup toward the end of cooking, possibly 1/4 cup if need be. Then don’t add it! I just don’t put any ketchup in it at all. I use it the first time and like you I’m not a fan of ketchup. And I could t even eat it because the ketchup just took over. I was wondering if cooking the veggies as long as the meat, don’t they get mushy? Not at all. Actually, my carrots still had a little bite to them, which I like, and the potatoes were soft and perfect! wrote recpie down i am making this for the fall. Hi Holly, Thanks so much for always answering back to our comments. I have a question for you. Do you have any yummy recipes for wheat and/or white bread? Thanks so much! I have got to make this!! Just wanted to double check on the cup of ketchup. 1 cup, is that correct? Just seems like a lot. Just wanted to be certain. 🙂 It looks delicious!! Also, about how many does this feed. 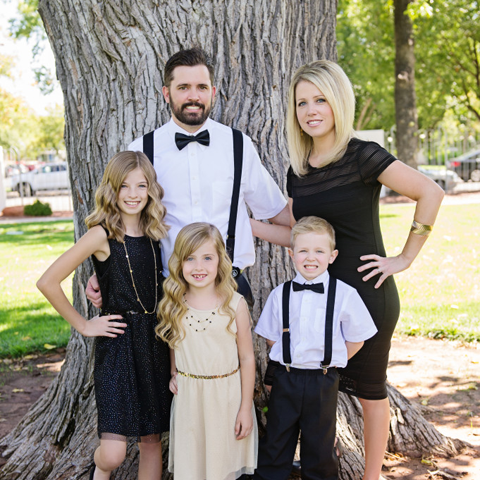 We are a family of 6. It serves around 8 one cup servings. Can this be made in a Dutch oven? If so, about how long would I put it in the oven for? You just coat it with the meat in the bag. It gives the stew a great flavor! You don’t need to add any extra in the stew. instead of peeled white potatoes could I use unpeeled red potatoes? Do you think this meal could work as a freezer meal? Looks delicious! I just started this in the crock pot, hope it’s as good as it looks in the picture. Best beef stew ever!! Loved the recipe!! It was so simple to!! Just put it in the crockpot now!! Looking forward to dinner. This looks amazing! How well does this recipe double? I made this stew this weekend, and my husband and my sons loved it,. I felt it was a little salty. When I was just re-reading the recipe. It says ” 2 (1 oz) packages dry onion soup mix.” I have never seen 1 oz packages of onion soup mix….so I am confused, cause I used 2 normal packages of onion soup mix, did I use too much?? I made this today – It was delicious! I made a few changes. I cut up a chuck pot roast into cubed stew size meat. I added 2 cups of frozen peas, an extra onion, about 3/4 cup of chopped celery, and salt and freshly ground pepper. I also cooked it in my crockpot on high instead of low. (For 4 1/2 hours.) After around 3 hours, I stirred it. So very good! Definitely a keeper! Thank you Holly for your great recipe! I was just wondering because i am on crunch time and i really want to have this tonight, if i put this on high for 4 hours, will it turn out just as good? I can’t say it will for sure because all crock pots heat differently… It may need 5 to 6 hours on high heat. Looks yummy!! Do you know if you can freeze this ahead of time before cooking? Like put it all in a bag and put in a freezer? Hi! Do you know if this could be frozen beforehand, maybe without the liquid, and then dumped in the crockpot in the morning with the liquid? I cooked this recipe a couple days ago for me and my roommates! It was delicious and so easy. One thing I did differently was brown the meat once I coated it with the onion soup mix to get that flavor to penetrate better, and it turned out sooo good. Thanks for posting this! I got the cream of celery soup that requires you to add a cup of water… Do i do this or just use it without the water? Do you know if it tastes good if you substitute tomato soup for the ketchup as a bit of a healthier option? We do not like cream of celery soup, do u suggest any alternative? I just turned the crockpot on .. Feeling hesitate as I have never done stew with ketchup!! Can’t wait to see how it turns! Just put mine in the crockpot!!! As I’m re reading the directions I realized I forgot to peel the potatoes…oops. I scrubbed them really well under cold water though. I hope it still tastes good!! Too early haven’t had coffee yet..haha..
Give it time, it will turn into a fabulous gravy! That is such a fun idea!! I’m currently in the process of cooking this. I’ll let you know how it goes tomorrow. Can’t wait to try it! I made this stew on Saturday. It was beyond fantastic!! Not only did I make a delicious meal for my family, but, I got to go out and have fun while it was in the slow cooker. Couldn’t have been easier or tastier! Followed the recipe to a T – wouldn’t change a thing. Thanks so much for sharing. Hi Holly, I currently have this in the crockpot (yay!) and was wondering if you knew the nutrition info? Thanks so much for sharing – I’ve pinned a ton of your recipes and can’t wait to try them all! This recipe in a pressure cooker versus a slow cooker? Do you think I could make this on the stove in a large pot instead of in a slow cooker or crockpot? Making this tomorrow for dinner. Ketchup pretty much dominated the flavor did I do something wrong. I’d like to make this but I’m wondering what makes the liquid in the stew Do you add water? No, dont add water. the soup and ketchup turn into a thin gravy. It is delicious! Just to clarify, you DON’T put all of the dried soup mixes in right? You only put in whatever coats the meat and discard the rest? Thanks! Has anyone frozen this and thawed after? I have and it was just as good after freezing. Do you add any water or beef broth? There isn’t any liquid?? This recipe was REALLY good. I added 3 chopped up celery stalks. It was easy and simple to make. Perfect comfort food. This will definitely be added into my arsenal of Crock Pot recipes for the winter. What is the green herb in the picture with this posting? Did you add parlsle? I recently made this it turned out pretty good . But can I use something other then the ketchup ? I’m not big on it and the ketchup flavor really stuck out to me . Katie, I would imagine you could use a 10 oz. can of tomato soup but not sure on the results. I love the flavor of this stew and I don’t taste ketchup, so I’ve never had to substitute it before. This recipe is a true winner….delicious! You use the can of condensed cream of celery. Just dump it right in. No need to heat first or add water. Just wondering if you cook the meat before putting it into the crockpot? This was delicious! I substituted the celery soup for cream of potato because that was what I had on hand. Hubby, kids, and I all agreed this recipe is a keeper. Thank you for sharing! I just made this this morning I’m excited to try it however I forgot to grease the crockpot will this make a big difference?? I don’t think it will be a problem at all. Next time use Slow Cooker liners, found next to the Ziplock bags in the grocery stores. plan on making a version of this tonight… I am going to put it on high though seeing I am staring it in the afternoon instead of being able to let is sit all day on low. I am also going to use cream of mushroom and nix the ketchup.. I might add crushed tomato because I know I have that and not paste.. not sure yet. I will let you know how it come out. I made this tonight and it was wonderful ! I’m not a fan of ketsup so I used 1 cup of tomatoe sauce. It was perfect !! Thank you for the delicious recipe !! I am following your choice w tom sauce and holding my breath, it is in the crock on high, for 4.5 hours maybe. Hope it is good! I want to make this tomorrow. Could I mix up everything tonight put in fridge & add potatoes in the morning? Made this tonight and loved it!!! I made this this weekend and we loved it! I subbed the ketchup for a can of tomato soup and the flavor was wonderful! Next time I think I will cut the meat in half and maybe add celery since I love soups with heavy veggies! Thanks for sharing! Thought it very odd there was no liquid so I added a cup of water. Prefer my stew with plenty of broth. I am currently making this beef stew and after reading the comments about the ketchup, is there any thing I can add to the stew in the event the ketchup it’s too overpowering? So after re-reading the instructions, I realized I didn’t grease the inside of the pot beforehand Hope that won’t make such a difference! Will post my opinion after dinner! Best stew I have ever had!! Love this so much. Opposed to the others who didn’t like ketchup I didn’t taste it much at all but am a big ketchup fan thanks for a great dinner even for a college kid! Just a quick question.is the cream of celery soup and ketchup the only thing for the juices? . Or am i supposed to add water to? Just add tomato sauce instead of ketchup. My family loves this recipe! I am in need of the nutritional facts if possible please!! Thank you in advance. I loved this stew!! One of the best! I used about 1/3rd cup of catsup. Just wonderful!!! 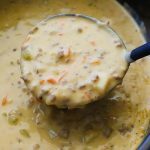 Question – what could I substitute the cream of celery soup with, since my husband is lactose intolerant? I made this for dinner tonight working with what I had on hand so I had less carrots, one less potato, and half the meat, however it turned out 10000000000% DE-FREAKIN-LICIOUS!!!! I did change a few things though, because my two year old was to be eating it as well, I chopped the baby carrots into thirds, I also only used 1/3 of the ketchup since some of the comments suggested it was too much, added a splash of worcestershire and a splash of ACV! It is soo good!!!! Thank you for sharing the recipe!!! I wanted a more beefy flavor so I used 1/2 cup ketchup and added 2 beef bouillon cubes. very yummy. My entire family enjoys this and many other recipes you have shared. This worked perfect, way less ketchup taste and makes for an awesome beef stew recipe, I added a bit of beef broth too. Love beefy tasting beef stew! Do you really need a 7 qt slow cooker for this? I have a 5 or 6 qt and I would think that would be. If enough since it only makes 8 cups. I made this tonight and it was sooooo delicious! I added a can of diced tomatoes and peas! Soooo yummy! Thanks for the awesome dinner! The ketchup made it to sweet and taste a lot like ketchup. I added beef broth to simmer down the ketchup taste and some black pepper. Helped a lot and taste better. I also added some parsley towards the end. Taste a lot better. I really like the idea of using the dry onion soup mixture as a rub for the meat. I will def have to try this. ***Highly Recommended*** I made this last night with positive comments all around, actually great comments and I have a family of harsh critics. I read the reviews and decided to reduce the tomato sauce/ketchup to 1/2 cup, I also added a couple of teaspoons of crushed garlic to the soup mix before adding to the slow cooker, plus 1 cup of frozen peas about an hour before serving. I used a small slow cooker with beef that must have come from an old cow, tough as! I ended up cooking it for 6 hours on high, it took that long for the contents to heat up and meat to become tender. Thank you for such a wonder slow cooker recipe that will be made over and over again. I just made this. I was worried about the comments saying it would taste to much like ketchup, so I did 1/2 cup instead. It was absolutely delicious and all my family had seconds. I will be making again. I also used canned whole potatoes to cut on prep time. Thanks!!! Hi holly I wold love to make ur stew but sadly we can’t get cream of celery soup in nz do u know what I can use instead that will still be yum? 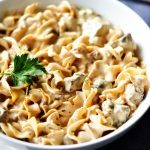 I use this recipe to make my own – the canned stuff has a lot of sodium. So you say to cook for 8 hours on low, can you cook it for 4 hours on high…? Do you think tomato past or tomato soup could replace the ketchup in this recipe? This is THE recipe I’ve wanted! Absolutely delicious and super easy. I messed up by grabbing a can of cream of celery and a can of cream of chicken soup instead of 2 cream of celery soups but they worked fine. Deeeeeelish!!! Can I use a Dutch oven for this? Made this for dinner and it definitely needed to have a little water added to it. Do you have a recommendation to add to it to help dilute the ketchup taste a bit? I have about two hours left on mine and it smells very ketchup-y. May be a stupid question but you say to layer all the ingredients with the soup mix on top. Can I mix it or do I just leave it with the meat at the bottom??? What can I substitute the cream of celery soup with? I thought this was great. However, instead of ketchup, I used a can of tomato soup and a half of a cup of low sodium beef broth. I will definitely be making this again! Made this for dinner tonight and it was a hit!! I didn’t change a thing and it was so good. The whole family loved it! Thank you for sharing. Definetly will be making again!!! I put the ingredients together tonight. Gonna put it on in the morning and timer is set. Just put this on! It’s really cool and rainy here in my part of Tennessee today. I’ve had this recipe on hand since September and thought today was the perfect day to try it! Can’t wait to taste it. Got it in a little late, though so I’m having to cook it on high for about 5-6 hrs! Luckily I’m home to keep a good eye on it. I’ll let you know what the family thinks! Mine is in the crock pot now! Can’t wait to taste it! (Hope the Katsup doesn’t over ride the meaty hearty taste!). Added some celery and celery salt just in case! Loos so good Holly! mine is looking to be too thick. can water or broth be added to cut the thickness? I followed the instructions exactly and this stew was so delicious! I was really skeptical about the ketchup but all the flavors cook down and meld together. I cooked the stew for 7 hours on low and then the last hour on high because at the 7 hour mark my potatoes weren’t cooked as much as I would like but after an hour on high they were perfect! We finally had some cool weather here in California so I made the beef stew last night for my adult son and his friend. They RAVED about it! None of us had a problem with the ketchup issue but we all like ketchup. I followed the recipe exactly except I added an entire bunch of celery cuz we love it. I have a 7 quart slow cooker and there was plenty of room. It was wonderful and the recipe has already been transcribed into my “keeper list”. Thanks for a great recipe! We’re having leftovers tonight!!! Yay! This looks absolutely delicious! :) I was just wondering how it would work to cut the recipe in half? It’s only my husband and I so that would be a lot of leftovers!! We loved this stew. On of the best I’ve ever made. Only had cream of mushroom soup. Did add and extra pound of beef, 2 bay leaves, a tsp. each of thyme and herbs de Provence, 1/3 c red wine & 3 cloves of minced fresh garlic. Will try with cream of celery next time. I started making this and then read the comments about it tasting too much like ketchup and got a little worried. So I tasted it and it was a tad too much for my liking but, I just added 1 can of beef broth and a bay leaf. It was amazing 😉 Thank you for sharing this recipe! 11/14/16. I made this tonight in the large oval size crockpot. I followed the recipe to a T! My carrots weren’t cooked all the way, and the ketchup taste was too heavy. My husband said it reminded him of tomato soup. After we ate the first two bowls. I added a can of beef broth as Christina said and turned it back on for two more hours. Going to give it a try. What can it hurt? Will get back to you and let you know if it helped any. I’m so glad I read the comments before making the stew. My husband and oldest son HATES ketchup. So, I added 2 tablespoons of tomato paste instead of ketchup. I also threw in a bag of frozen green beans. 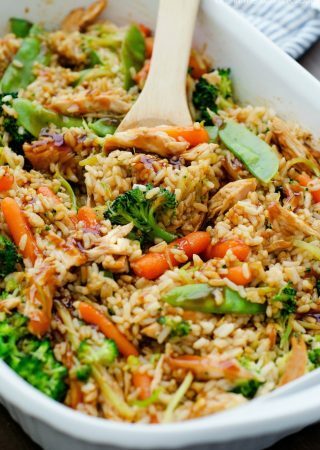 This recipe was awesome, my family loved it after a long day on the field of playing baseball. Thanks so much! I just made this amazingly delicious beef stew tonight. I cooked it on high for 5 hours and it’s perfect. I made it with 50% less sugar and sodium ketchup. For those of you that don’t like ketchup, it DOES NOT taste like ketchup. It’s a wonderful gravy. To the cream of celery and ketchup mix, I add some minced garlic. When everything was done cooking I dumped a can of drained peas in and this is absolutely perfect. Read all of her directions and follow it to a “T”. The directions are very simple enough but it seems like folks are asking questions in the comments that she already explains in the directions. Just read. 🙂 Absolutely easy and delicious! Thank you, Holly! Made it for Sunday dinner…..very flavorful and tasty!!! Will make again! This is in the winner category, everyone had seconds. I did use tomato soup instead of ketchup and added mushrooms. Thanks. Looks great and sounds simple! I have a 4-quart crockpot….is this too small for this recipe? If I cut it in half, how long would you recommend cooking it for? This stew is perfect! was a little nervous after reading the comments about the ketchup but you cant taste it at all. Definitely had a strong ketchup/tomato-ey taste. Added beef stock and it cut down on the taste but not enough. Would definitely be good without the ketchup, and maybe some sory of beef stock or gravy in its place. Onion soup made the beef delicious! Used the homemade equivalent of two cans of cream soup + 3 tbsp. tomato paste + 1 tbsp. A1 steak sauce and a splash of Worcestershire sauce for the gravy. Nothing against canned soups — I just forgot to pick any up at the grocery store. Thank you for sharing! We’re going overnight with this recipe and delivering tomorrow to a friend who’s recovering from surgery. Smells delicious…visions of beef stew no doubt will be dancing thru our heads this eve. Am so excited and nervous am making this stew, but I forgot onion dry spoup mix instead I got d Ranch Dip Mix?!!! I hope it turns out?! Made this last night. Only used half cup of ketchup and it turned out really good. I also just tossed in a bowl instead of a bag and it was easier. I started it late so cooked on high for 4-5 hours and it made the meat a little too done. So next time I’ll cook on high for only 3-4 hours. Super easy and perfect for busy weekdays. I love love love this recipe!!! Made it tonight and it was perfect!!! In crockpot now, anxious to try it. Thank you. I just wanted to know if you can taste the ketchup? Feel like my sister would have a cow & not want to eat it if you can. & also is it possible to double this recipe? Thank you so much for sharing this. I made this tonight and it was delicious. my son that is very picky even liked it. Pinned this last week and now have it in my crock pot for tonight. The weather has been Hot here in NW GEORGIA but tonight it is supposed to be RAINY and temps dropping so I thought this would be Great for a Rainy Night in Georgia! I currently am on hour 7 of this stew in the crockpot!! It smells absolutely delicious! I am dying to take the lid of to stir but am hesitant please let me know if I can stir it or not!! Thank you! What is the calorie count for one serving, or one cup of the stew? Tried this tonight. It was absolutely incredible. Like everyone else, I was dying to stir it but ignored the urge. So glad I did. It broke down into a nice gravy. Yum! Can I add peas and corn in a can to this? I was thinking of using V8 juice in place of the ketchup. Or half ketchup and half V8. Do you think that might work out alright? Our kids celebrate Christmas with their in-laws and we come together for a giant relaxing time later. Today the wife and I celebrated Christmas with the beef stew. I suggest that you plan to make it twice. The first time, follow all instructions exactly and remember that the final results may be hard for you to predict. It’s wonderful, and perfect for us, but save the changes for the second time. The condensed cream of celery soup was genius. Just right thickness for a stew. Thank you. OMG. It is -29 degrees tonight for New Year’s Eve and I’ve had this in the crock pot all day. This was FABULOUS. The only thing I did different was add a splash of worchestshire and a beef bullion cube to it. Absolutely amazing and warmed our bellies on this freezing night. Thank you!!! I have this cooking in my slow cooker right now! I substituted tomato sauce for the ketchup based off of reviews and me not loving ketchup! I can’t wait to try this! I’m trying this recipe right now! It looked so easy and it really was! I didn’t have baby carrots so I used chopped regular carrots and I don’t like potatoes so I substituted turnips (mama’s secret to get me to eat stew) . Hope it comes out good! I made this exactly how the recipe states. The only thing I did different was cook on high for 4 hours because I started at 1 and didn’t have time to leave on low for 8 hours. It came out so incredibly good!! Don’t change anything! I will make this again! Hi! 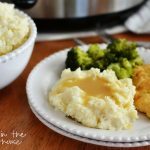 I have made this recipe a few times and love it! I am wondering, have you have made it in an instant pot yet? How long do you think it should cook in an instant pot? Thank you! It definitely is not a healthy stew but sure is delicious! After reading all of the comments I did 1.5 packets of onion soup mix, 1/2 cup of ketchup and added 2 dashes of Worcestershire sauce on top once I assembled everything in the crockpot. Everyone loved it!!!! It was delicious!!! This will definitely be a staple in my house! Yay! Glad it was a hit for you too, Courtney. We just love it! I make this every week! It’s so good and easy to make. The only difference is I only use half cup of ketchup. Perfect for cooler days! A little too ketchupy, would definitely try with tomato soup when I make it again. I’m just getting ready to make this but realized I only got one can of cream of celery soup. I can’t get to the store to get another one do you have any suggestions what I can use for the second can of soup? Any other cream of soup would work! Chicken, mushroom, etc. If you don’t have any of those you can still make the recipe, the sauce just won’t be as thick. Hope this helps! Made this today for my men’s group meeting tonight. Made it straight by recipe but added crushed red pepper for a little heat – stew was amazing, none left!